How to choose the right impact windows for your home? Maybe you have finally decided to renovate and upgrade your home in the coastal area, and you chose to install new impact-resistant windows and doors. Or perhaps you reside in Miami, Fl or any other Hurricane-prone areas where you must install impact-resistant doors and windows to a new structure. It is a smart Hurricane preparedness move because of to how sturdy, reliable and suitable the glass material is to wind-borne debris and tropical storms. But what you probably don’t know is, the process of choosing and buying the best Hurricane resistant windows isn’t as simple and straightforward as it appears. First, you must research the type of windows you would buy – business or personal, the material, pricing, etc. It’s vital that you take the right steps when choosing one lest you opt for a fake or unreliable impact window type. Hurricane windows can be costly to buy and install. Price variations do vary with where you are located, the retailer and other factors. But the best thing is to start by choosing one that will last longer, regardless of the cost of purchase and installation fee. Ideally, those whose frames and sashes are made using top-quality products (100% American made) last longer than their Chinese alternatives. Feel free to ask for a QUOTE. Cities and towns have different codes that must be followed when installing new impact-resistant windows. You must, therefore, know what code your home is in before buying the glass material. Custom sizes of the doors and windows are ideal to properly patch up the window area and give it a cosmetically impressive look. A custom size will mean the impact glass fits snugly and opens with little difficulty while reducing any chances of water and air leakage. Essentially, the seller will charge you according to the size, and you won’t prefer to buy an excess of what you would need. When buying impact glass, ask the seller about its U-factor and R-value. A small U-factor means it has a lower rate of heat flow, while R-value explains more about its insulation – higher value insinuates it insulates better. It is expensive, so don’t shy away from requesting a warranty. Take your time to go through the terms of its warranty too. A warranty period of five years is fantastic! 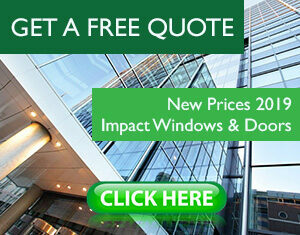 Also feel free to browse our IMPACT WINDOWS CATALOG. ← Are casement windows good for the storm?